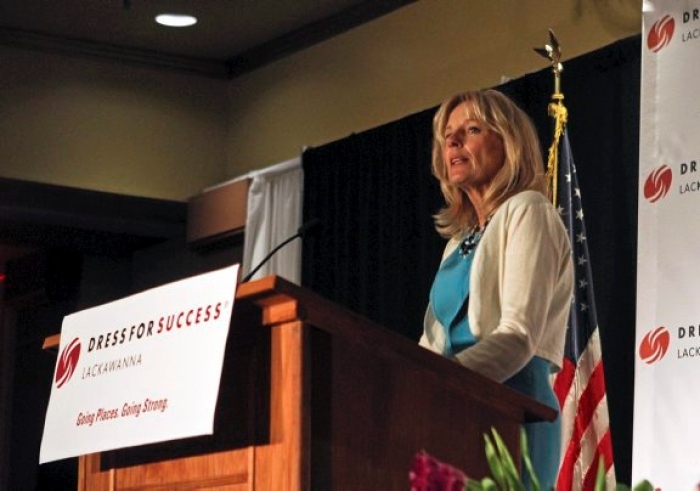 SCRANTON — Jill Biden, the nation’s Second Lady, addressed a Dress for Success luncheon at the Radisson Lackawanna Hotel in Scranton on Monday. She spoke to a crowd of around 500 people about the importance of empowering and educating women. “I know the streets and the ball fields and the restaurants and the elementary schools, so it’s nice to be here. I feel like I live here, practically,” said Second Lady Dr. Jill Biden. On this visit, the vice president’s wife stopped by a luncheon for the 15th anniversary of Dress for Success Lackawanna. Dress for Success is a non-profit organization that helps women get into the workforce by giving them gently used professional clothes, resume writing help, and interview tips. Dr. Biden used her keynote speech to talk about the importance of empowering and educating women. “We believe our country is at its best when we lift everyone up, and when we make sure that every opportunity is fully available for every little girl or grown woman,” said Dr. Biden. “She actually represents what dress for success stands for. She’s an accomplished woman. She’s a highly educated woman. She really focuses on the needs of women,” said Dress for Success Lackawanna executive director Mary Ann Iezzi. Event organizers say it was a full house at the Radisson with about 500 people showing up to hear the Second Lady speak. “That is not an easy feat, but it speaks volumes for the organization and their efforts,” said Mary Bowen of Scranton. Though Dr. Biden was in and out of the luncheon due to a tight schedule, women attending say they were impressed with her speech. “Very, very good. And it shows that anything can happen if you put your mind to it,” said Bowen. Vice president Joe Biden is speaking at the Greater Pittston Friendly Sons of St. Patrick dinner in Plains Township Monday night. The vice president made a few unscheduled visits in the area Monday afternoon.